Almost every corner of NoMad has layers of history. That’s not surprising, because from New York City’s earliest days, our neighborhood was a natural hub of city life. The crossroads leading out of what was then the northern limits of the city, branched just above 23rd Street to the East up Broadway and off to the West to New England on the Boston Post Road. Coaches on their way in and out of town made this a stopping off place. And so it began. Later, our area was to become the political and economic heart of the nation and the social and entertainment center of New York during the Gilded Age. Now 100 years later, the area is once again a hub of city life. 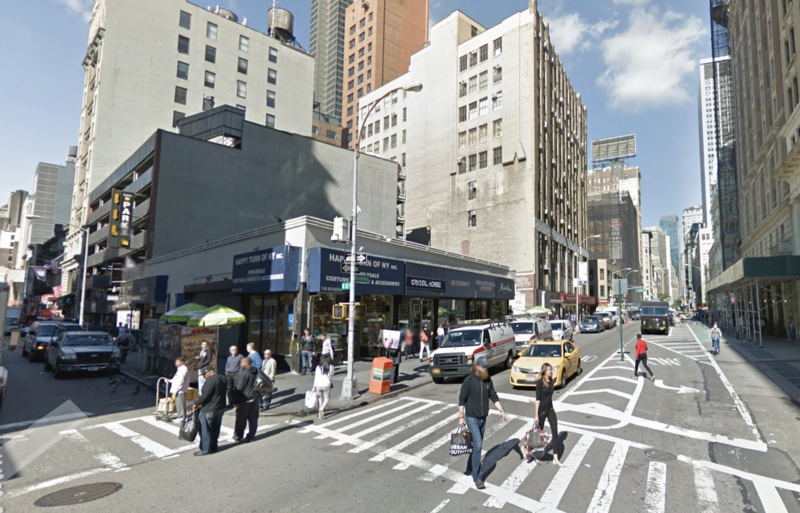 When we heard about the development of the new Ritz Carlton at 28th and Broadway, we decided to dig down into this corner’s history and found that this site bears witness to every step in the area’s illustrious past. When guests pass through the lobby of the new Ritz Carlton, they may not realize that the ground beneath them carries so the memories of so much history. The documented history of the Ritz Carlton land goes back to about 1670, when Sir Edmond Andros granted a land patent to Solomon Peters, the son of Pieter Santomee, a free African American who had once worked for the Dutch West India Company. The land consisted of 30 acres bounded by Abington Road (21st Street), the Bloomingdale Road (Broadway), Seventh Avenue, and 29th Street. Solomon bequeathed the property to his wife, Maria Antonis Portugues. The land passed to Maria’s heirs and in 1716 they conveyed the land to John Horn, a wheelwright, and his brother-in-law Cornelius Webber. At this point, the large land holding began to be divided. In 1751, Jacob Horn conveyed about 17 northerly acres to John De Witt, a Dutch farmer. 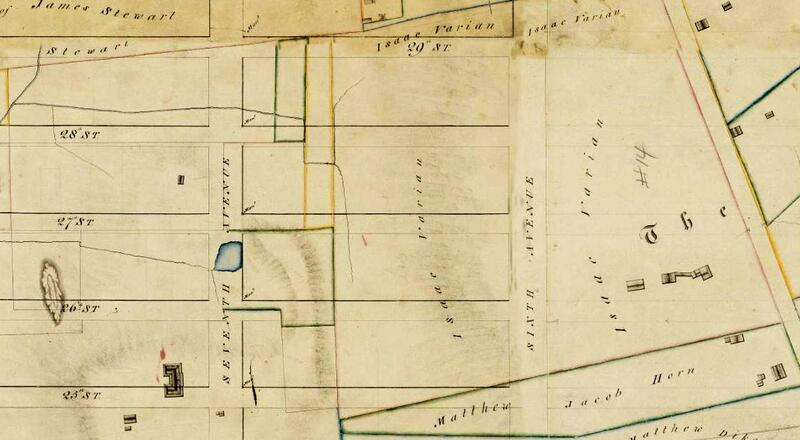 Then, in 1787, De Witt’s executors sold the 17 acres to Isaac Varian, a butcher and farmer for 1,280 pounds, and Varian established his homestead on the Bloomingdale Road (Broadway) just north of 26th Street (see map above), where he lived fully until his death — he was married three times, had 16 children, and was 79 years old when he died in 1820. After his death, at least two generations lived at the old Varian homestead until it was demolished in 1850 to make way for new townhouses. Up until this point — the Civil War is still 10 years in the future, we can imagine the farm in a bucolic setting. 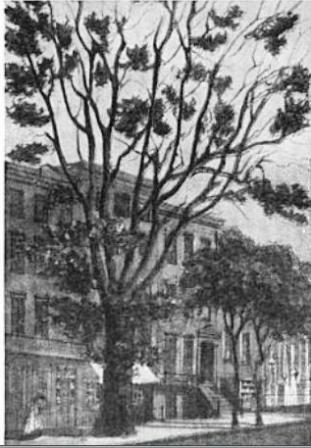 Indeed, a large tree that marked the gateway to the Varian Farm continued to stand in front of 1151 Broadway, near 26th Street, and only disappeared just before 1880. Remarkably, there are even images available of this last relic of the Varian Farm. Starting around 1830, the many heirs to the Varian estate began selling off their allotted lots to individual buyers and speculators. But one great-granddaughter, Lucy Varian, held fast to her land. Even after Lucy married Henry Gilsey, the son of real estate mogul and city alderman Peter Gilsey (famous for building Gilsey House), she refused to sell to her own father-in-law. 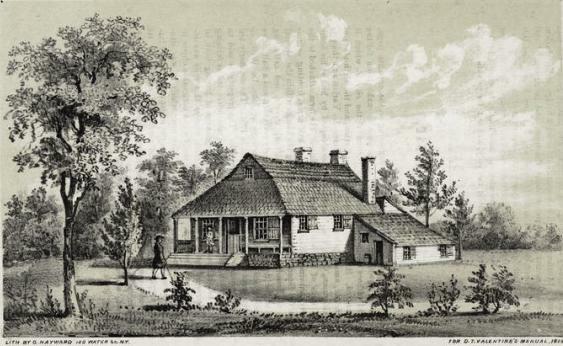 He had to lease the land from her upon which he built his house and a performance hall on West 28th Street. After the Civil War, the NoMad area became a center of national life, and entertainment venues sprouted up throughout the neighborhood — from houses of prostitution to gambling halls and legitimate theatres. 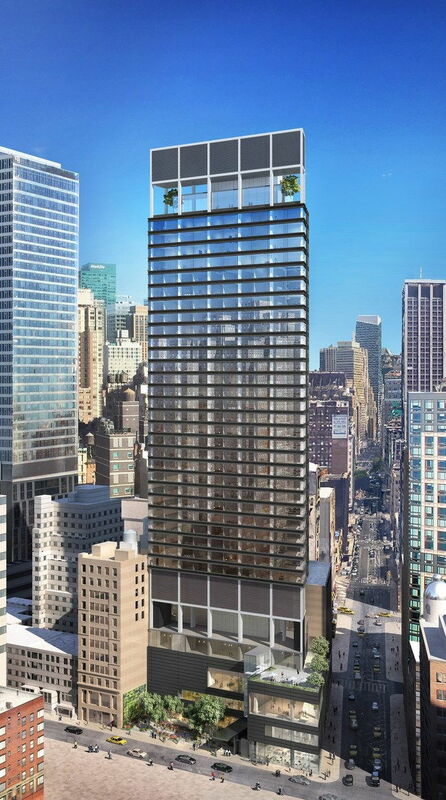 As part of this development, Peter Gilsey erected Apollo Hall on the land he leased from Lucy on the north side of 28th Street, a few doors west of Broadway. At the same time, he also built a rowhouse next door at 33 West 28th, where he and his family lived. The Hall was only two stories, with the upper floor used for lectures, readings, balls, and political meetings; the lower floor for public amusements. Opened on October 16, 1868, it changed management several times in turn becoming Newcomb Hall and then St. James Theatre. In June 1873, the Gilsey estate began transforming the building into a true theater with seating for 1,900 people. 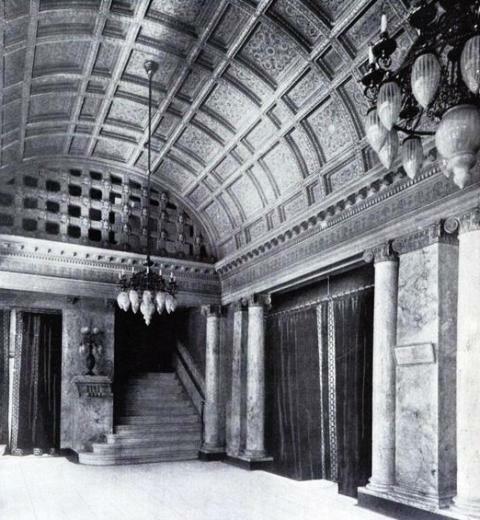 The work was completed in December 1873, whereupon flamboyant theater manager and playwright John Augustin Daly obtained a lease for the new venue. 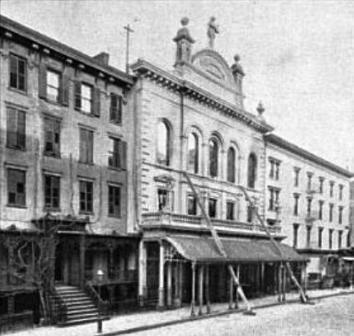 Daly was in need of a new theater, having lost his Fifth Avenue Theatre on 24th Street (adjacent to the Fifth Avenue Hotel) in a fire on January 1, 1873. Daly opened the new theater on December 3, 1873 and renamed it the New Fifth Avenue Theatre and continued as proprietor until 1877. In 1877, Daly was followed by John T. Ford, who removed “New” from the name. In that same year, the Fifth Avenue Theatre became the world’s first air-conditioned theater, when a ventilation system was installed that blew air over blocks of ice to cool the audience. Other historic events occurred under Ford, too. In 1879, the theatre presented, in cooperation with the D’Oyly Carte Opera Company, the first official U.S. productions of Gilbert and Sullivan operas, beginning with two of their greatest works: the New York premiere of H.M.S. Pinafore and the world premiere of The Pirates of Penzance. Here is where the plot thickens. 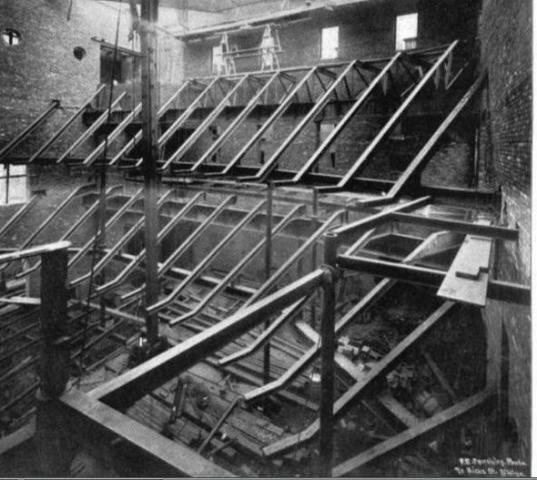 In 1889, Andrew and Henry Gilsey, two of Peter’s seven children, decided to demolish the row house and the old theater and build a new theater facing Broadway. To help finance this plan, they told the new manager Tompkins they would only renew his lease in 1891 if he agreed to make repairs to the old theater and also build a new theater at a cost from $100,000 to $150.000 in 1891. Tompkins refused the terms of the deal. It turns out he had discovered that while the ground covered by the auditorium belonged to Peter’s sons, the ground covered needed for the new stage still belonged to Lucy Varian, who refused to renew the lease under any terms. Tompkins turned the lease over to H.C. Miner for the 1890-91 season. Those in the theater industry who read the terms of the lease felt that Miner was getting a bad deal, since it would probably cost more than $150,000 to build a new theater. Then on January 2, 1891, a timely fire occurred. At about 11:45, night watchman Daniel Finn reported flames coming from the cellar of the theater. By the time firemen arrived on that windy night, the fast-moving fire was not only burning down the theater but also threatening to destroy several other nearby buildings, including 1195 Broadway (Herrmann’s Theater), 1182-1196 Broadway (Sturtevant House), and 33 West 28th Street (Mrs. Peter Gilsey’s residence). While high winds and an all wood structure explained in part the rapid advance of the fire, the Fire Department suggested that a propellant might have been involved. According to a report in The New York Times the next morning, the Gilsey brothers, and Harry Miner, in particular, didn’t seem too upset as they watched the flames destroy their property: “Harry Miner, the proprietor of the Fifth Avenue Theatre, was one of the coolest of the spectators. He looked on the flames that were consuming his property and was not once heard to bemoan his misfortune.” It seems they were well insured and the fire now paved the way for building the new theatre facing Broadway. There was one historic casualty of the fire — the legendary Sarah Bernhardt was scheduled to perform at the Fifth Avenue Theatre on February 9th, just over a month later. At the peak of her fame, she readily found an alternate theatre for her performances in New York. Finally, Lucy Varian sold and a new fireproof Fifth Avenue Theatre was built. The new theatre opened on Saturday night, May 28, 1892. It could accommodate 1,400 patrons, but unlike its predecessor, and many of its contemporaries, it featured rows of seats, both on the orchestra floor and in the balconies, rather than benches. 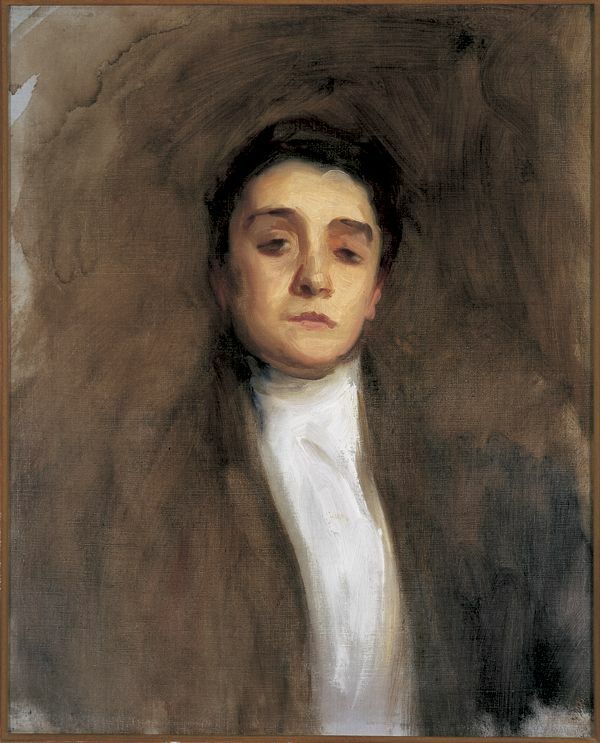 And history continued in the new theatre when famous Italian stage actress Eleonora Duse made her American debut at the Fifth Avenue Theatre on January 23, 1893 in La Dame aux Camélias. Henry Miner continued to manage the theater until Frederick Freeman Proctor took control in 1900. As the theatre district moved north to Herald and then Times Square, the theatre turned to vaudeville acts and movies by 1915. Sometime after 1929, Proctor bowed out and movies were replaced by burlesque shows. On April 8, 1936, Emigrant Industrial Savings Bank acquired the property in a foreclosure. The old theater was demolished in 1939 in order to reduce taxes, and for years it was the site of a multi-level parking garage and a series of one-floor wholesale outlets. It seemed a rather indecorous end to this glorious farm and noteworthy theatre. There is a sense that this project, just like the famous theatres before it, comes at the right moment, is a lodestar for a more exciting, attractive neighborhood, and will itself become the site of history-making events someone a hundred years from now will be documenting. The $500 million tower will feature 250 hotel rooms and 16 branded residences and is expected to open in 2021, 351 years after our story began. Varian, Daly, Gilbert and Sullivan, Bernhardt, Marriott, Ritz Carlton, and Flag Luxury – all part of history and making history.